Now there are many Indian Restaurants to choose from in Brighton, and I would say that a good handful of these are really very good. Indian Summer is definitely amongst that handful and it was a pleasure to visit here with a friend one brisk, autumnal evening. 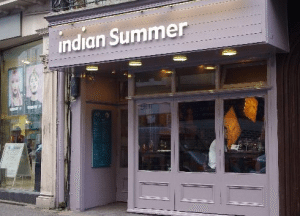 Located in central Brighton on East Street in the Lanes, Indian Summer is a modern, stylish restaurant serving fine dining Indian food cooked with obvious experience and passion but in a very comfortable and welcoming environment. Owner Minesh originally had a career as a Prosthetist before he realised that he wanted to share his parent’s dreams and cooking experiences by opening a restaurant to serve real Indian food. When we arrived the restaurant was empty, as we were there quite early in the evening so we had a number of tables to sit at. It was very sleek inside, and was well maintained and looked after by somebody who cared. We ended up sitting near the back of the restaurant where we were directed to and watched the venue slowly fill up as the evening proceeded. The menu is not too big, and is very suitable for someone who is gluten intolerant. Minesh told me that a lot of Indian food is traditionally gluten free, as in India, they don’t really eat or cook with many eggs, so they use chickpea flour (gram flour) for most of their baking instead, which gives it a similar texture, but is naturally vegan and gluten free. 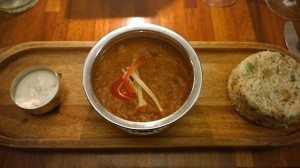 The style of food is modern Indian cuisine, with traditional ingredients but presented beautifully and with a lot of care. wine before, and the taste notes made it sound delicious. It was in fact very tasty, and had a buttery mouthfeel with a peppery taste. I will be certainly looking out for more Indian wines from now on! We ordered our food after taking a good while to decide what to have, as everything sounded so good! 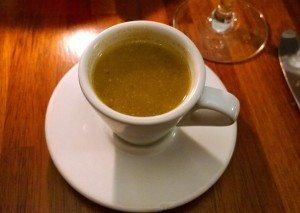 As soon as we had ordered we were brought an amuse bouche of homemade curried soup that was made with spinach, kale, broccoli and sweetcorn. It was quite spicy, but so full of flavour and spices and very warming on the cold afternoon. 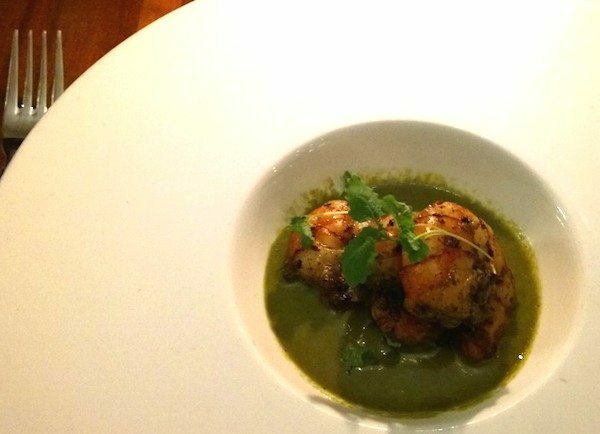 There was no doubt that it got our taste buds revved up for the next course. Our starters arrived shortly after, I had ordered the Dum Malai Murgh, which is tandoori chicken smoked with whiskey oak and served in a creamy almond spiced sauce. 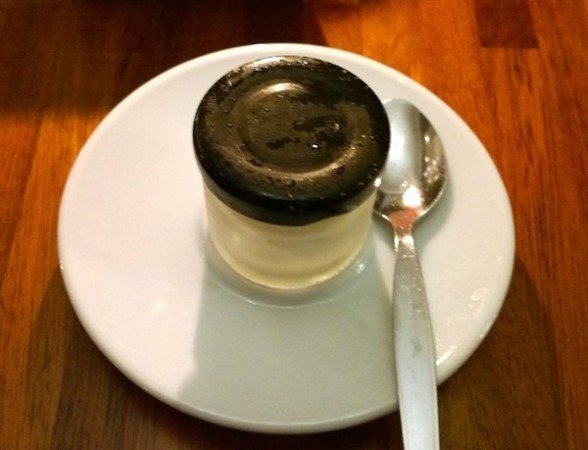 It was served in a small silver dish with a lid on top, and when the lid was lifted the smoke came out to release it’s wonderful aromas. It’s nice to have a little bit of theatrical experience while you’re out for dinner. The chicken was incredibly tender, and the sauce was creamy and lightly spiced with notes of tamarind and coconut. The smokiness really made it and added a real unique flavour to the dish. My friend ordered the Dum Prawns Hariyali, which were marinated in mint and served in a delicious mint and spinach sauce. They were so large and very juicy, the best prawns that I had tasted in a long time! The sauce was slightly peppery and had a strong, herby flavour. Our plates were whisked away as soon as we had finished, and we were brought a small palate cleanser which was a lemon ginger sorbet. It was lovely and spicy from the ginger, and zesty from the lemon, and so refreshing. As we were waiting for the mains I got up to check out the bathrooms, which were noticeably beautiful and well maintained. They had wooden walls, flowers, dim lighting and good quality soaps and lotions. It’s nice when a place makes an effort with their loos! My friend’s main came in a tiffin box that was taken apart as part of the presentation at the table. This was a nice touch – it’s all the little novelties that make you enjoy it more isn’t it? 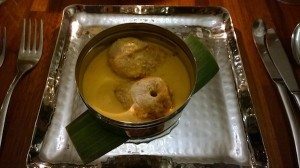 She ordered the Murgh Lucknowi which is a tandoori chicken dish served in a cashew, sesame and poppy seed sauce with ground spices. It came with garlic roti, mango pineapple chutney and basmati rice. The chicken was once again really tender, and the sauce was creamy, it reminded me of the butter chicken dishes that I used to order when I lived at home in New Zealand. The roti tasted a little bit like a dosa, but was thicker, and excellent for mopping up the curry sauce on your plate. I ordered the Rajasthani Laal Maas which was a gluten free dish. This was served with raita and basmati rice, and the lamb is cooked in spicy red chillies, cinnamon and cloves. 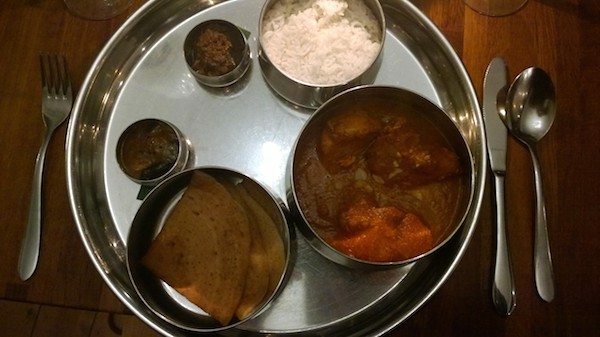 The curry itself was sweet and not too spicy, and rich with spices which I loved. The raita was creamy but with a slightly sour taste, it really tasted like proper quality yoghurt. We were served a taster of the Indian red wine with our mains which our waiter said that we might find it too spiced to go with the food but he really wanted us to taste it as we liked the Indian white wine so much. It was quite a young wine, and tasted of oak and cloves, and I can see what he meant about it being too spicy, as it was very strong in flavour but very delicious and not like any other wine that I had tried before. We were both quite full, but we did really want to try the desserts as they sounded amazing. Most of the dessert menu is compatible for gluten free which is a nice change so we were spoilt for choice! I chose the millionaires shortbread sundae without the shortbread that was made a caramel ice cream, and a thick, rich, chocolate brownie flavoured sauce. It was rather indulgent, the ice cream was creamy and sweet, and the contrast of the hot brownie sauce worked very well with the ice cold ice cream. My friend ordered the carrot halwa with white chocolate ice cream and mandarin coulis which is a gluten free dessert. It was something that I had never tried before and it was really good! 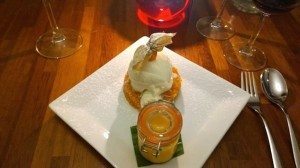 Beautifully presented with light and fresh flavours, the mandarin coulis cut through the creamy white chocolate ice cream so well. 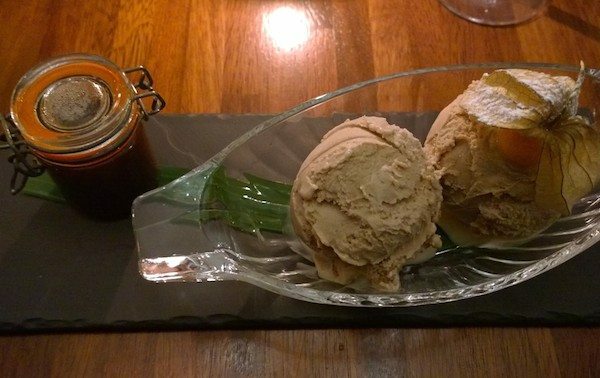 For an authentic Indian dining experience with a glamorous twist, you should definitely head to Indian Summer on East Street, your gluten free needs will be truly satisfied, and there is something on the menu for almost all types of diners. I think it’s a lovely place for a birthday or special occasion, and the staff will really go out of their way to look after you well. Do check out their exciting lunch menu, and their renowned cookery classes that I would certainly like to have a go at one day too!